I wrote my first article titled Birthervision in September of 2010. It was about how Birthers view people and events in a special way. This time I want to talk just for a moment about Birthers reading text. At the outset, let me be clear that misreading text, reading it to say what you think it should say rather than what it really says, is nothing specific to birthers. You will see words left out in my writing that I believe are actually there when I proofread the story, even after I’ve proofread it twice! So while I’m using commenter John as an example, I don’t mean to pick on him or to say that he’s any more prone to reading bias than someone else. 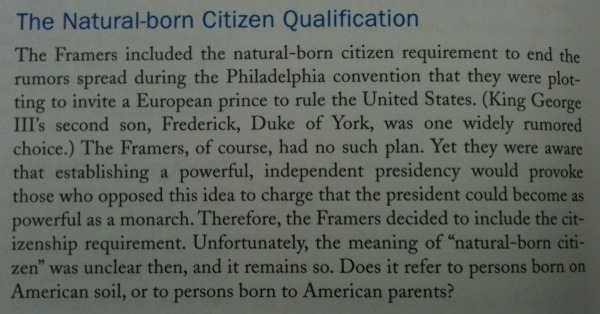 [The book] notes that only a “Natural Born” citizen can be president. However, the book left reader with a disclaimer and a warning. Does Natural Born Citizen mean simply being born in the country or does Natural Born Citizen mean being born in the country of US Citizens. The book did not claim to make an affirmative answer either way. 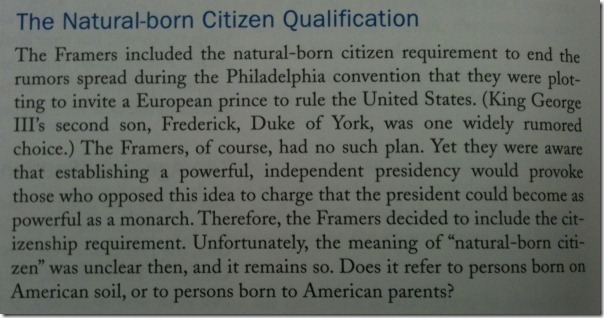 In this book, the author makes a mention of “Natural Born Citizen” regarding Article II Section 1 of the eligibility of the POTUS. The author maintains that meaning of “Natural Born Citizen” is not defined in the Constitution and intent of the words was unclear. The author leaves you with a question – does NBC mean simply born in the US or does is it mean born on US soil to parents who US citizens. What John said, after viewing the book reference twice, was essentially the same. The problem is the book says something different, as I discovered on a trip to my local library. So there will be is no “he said, I said” on this, I took a photo of The Constitution and its Amendments with my cell phone camera. [D]oes NBC mean simply born in the US or does is it mean born on US soil to parents who US citizens. Does [NBC] refer to persons born on American soil, or to persons born to American parents? Nowhere does the book offer the option John remembered, “born on US soil to parents who US citizens,” rather it offers the options separately: a President might gain eligibility from place birth and might gain eligibility from their parents. I will fault the article for its wording since no authority denies the presidency to someone born a citizen on American soil. It is only those born overseas to US Citizen parents where some doubt remains. So I urge Birthers in particular (because they are the ones whose theories fly in the face of all consensus authority) to read and reread their sources until they have excluded the possibility that they are reading things that really aren’t there. Well done Doc C, well done! One day, I sent an email some colleagues regarding an issue we were attempting to resolve. The “coordinator” of the project from IS sent a reply. Before I had a chance to open the email, another colleague IM’d me stating: “Did he even read the email?” Granted, the work I do in my “day job” is complex so my emails reflect this, the email in question was actual rather clear and straight forward. However, his reply was simply a question for the answer I had just given. 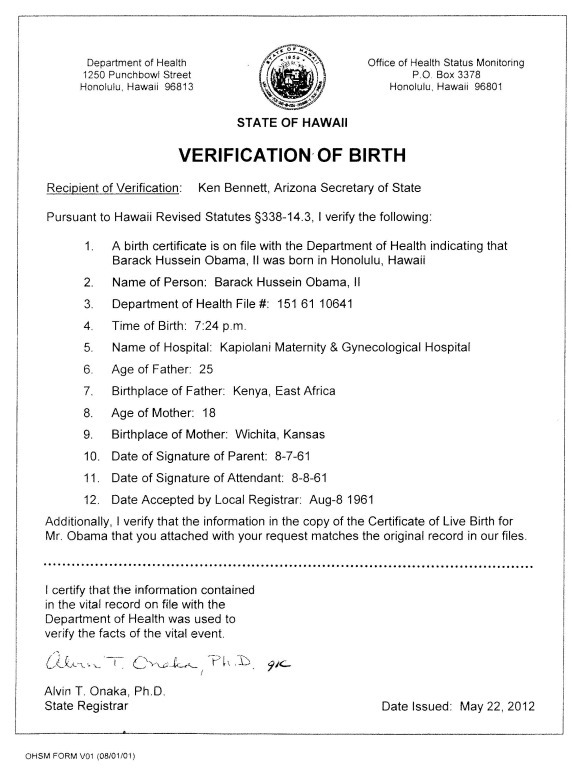 “Birthervision” does show up all over the place (I will avoid the stories where I did not read the emails fully). Great story and always nice when the source of confusion can be pinned down. I like it when people use real books and libraries for research. I should add that this is not the only book I consulted at the Library. It was, however, the only one that addressed the question. I looked at Encyclopedia of the American Constitution, 6 volumes with over 3,000 pages and not a single mention of the phrase “natural born citizen.” It mention US v Wong half a dozen times, though. I since learned that I can access this latter book’s electronic edition through the library web site. While there is a branch library within walking distance of my house, the main branch is the only one with the good stuff and it’s a 22 minute drive. Reality Check: I like it when people use real books and libraries for research. Although I don’t make too much use of them as of late, I find that the libraries at major research universities can be great tools. However, in recent years my local university (also my alma mater) has restricted access to students only at some campus libraries such as the undergraduate library and several of the topic-specific libraries such as the engineering or art history libraries. However, I believe anyone can still enter the main library or peruse the main stacks. I remember when the university used to have a School of Library and Information Studies, which has since been renamed. I remember taking a two unit survey class from that department, which was quite useful for learning how to efficiently use library resources. I kind of miss those days. Now there’s just so much stuff out there, where it’s a bit difficult to figure out what’s definitive and what’s dreck. It wasn’t necessarily that people didn’t put junk in print, but that fewer people did so because of the effort it took to publish into a printed medium. G: Well done Doc C, well done! 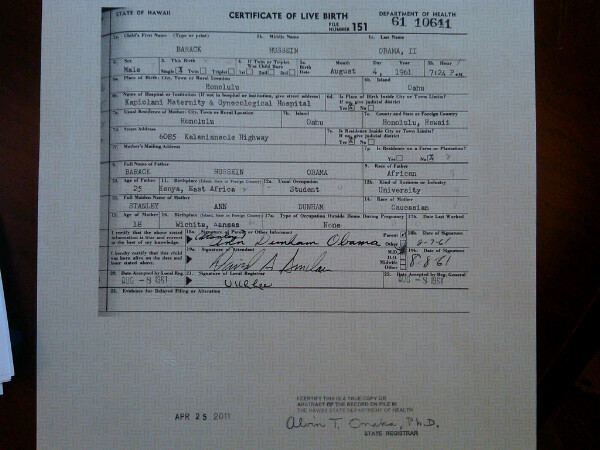 A birther caught lying? Must be a day ending with “y”. 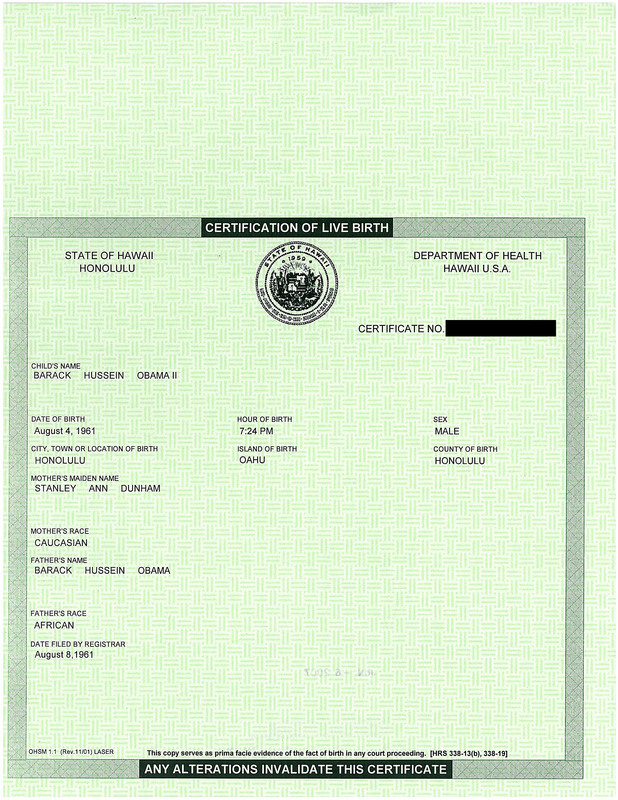 The Magic M: A birther caught lying? Must be a day ending with “y”. Usually when someone out and out knowingly lies, he doesn’t come back and amend his interpretation. I can well understand how he misunderstood and many times we want something to say what we want it to – so I think the brain allows us to read it that way and it’s not necessarily that we are too stupid to read the exact words and extract the intended meaning – it’s just a human flaw that we all have – yes, even the Obama followers have done it many times. I really don’t think – from the way Dr. C related the story – that John was lying. But of course – it would seem that Magic M wanted it to be that way, and so interpreted Dr. Cs words in a way that was most convenient to them and concluded that John was lying. 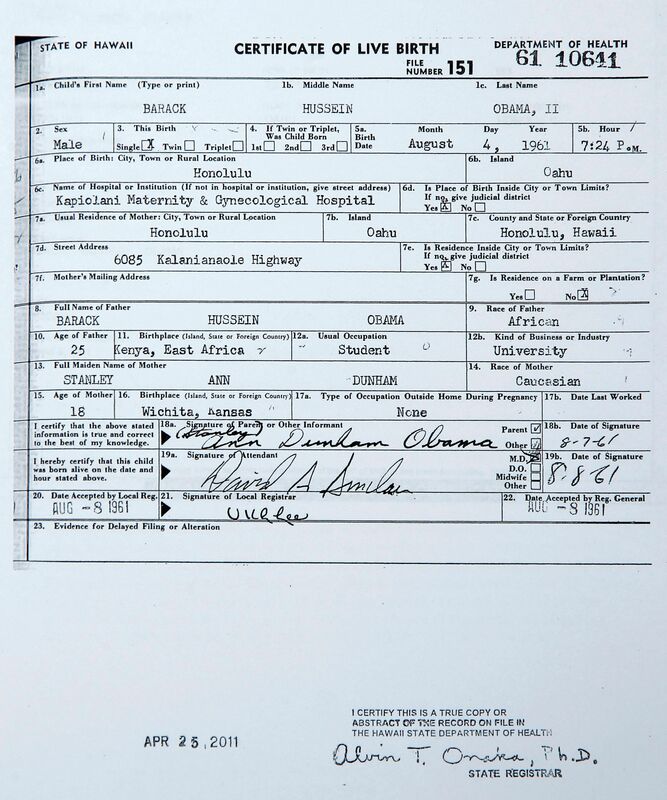 It’s human nature and we all do it – birthers or Obama followers – human nature doesn’t discriminate. Two people can see the exact same accident, from the exact same vantage point and report two different interpretations of what happened. It’s not that one or the other is lying – it’s human nature and our backgrounds, character, histories, families, etc. that influence what we see, or what we didn’t see. Hey, it’s a blog. I write about what happens and what I’m thinking about. But it’s hardly anything I just stumbled upon. I’ve seen this kind of problem all my life. Sally HIll: I’m a bit surprised that Dr. C made this type of incident out to be something so profound, perhaps it’s a concept he has just stumbled upon. I never meant to imply that John was lying. It would be foolish for someone to lie about something so easily verified and on a forum where things regularly get scrutinized and verified. Dr. Conspiracy: I never meant to imply that John was lying. It would be foolish for someone to lie about something so easily verified and on a forum where things regularly get scrutinized and verified. So, John was not lying; are you willing to admit he was wrong? A made-up, nonsensical scandal postulated by someone who actually knows better but stretches the truth to promote an anti-Obama agenda? That Justia? What in my language justifies your use of the words “so profound?” Could you be suffering from Birthervision? I think that’s a good example. 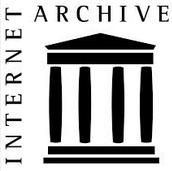 Justia is a good site for looking up Supreme Court decisions, but it is no substitute for a good legal library, and a subscription to WestLaw or LexisNexis. Dr. Conspiracy: It would be foolish for someone to lie about something so easily verified and on a forum where things regularly get scrutinized and verified. Remember birthers are not used to people making an effort to check the truth for themselves. Not one of them would go to a library to check if a book quoted on some block actually says what the blog author claims (heck, not even I would, on a typical day). And since the typical birther sits behind his keyboard all day, reading nothing but wingnut blogs, in his world, what you did wouldn’t pass as “easily verified”.